Sit at the edge of a wetland and watch: right ahead of you dragonflies dart at each other as they sort out territorial airspaces or zither around in honeymooning daisy-chains. Stinky-poo swamps. Bogs. Marshes. Glinting, glutinous, muddy water bodies, humming with stinging poisonous insects and emitting evil choking vapours — dip a toe and you’ll be sucked down with a bubbling gurgle of glee. Where great serpents and giant crocodiles lie in ambush and strange birds with wild, wanton calls speak of eternal lovelorn loneliness. That’s what the word “wetlands” conjures up in our imagination, doesn’t it? We, however, by and large, still think the worst of them. They’re evil, rank places which developers and politicians are quick to pounce on and drain. Who loves a stinking marsh and who would like to live near one? And so we’re draining them at the rate of 500,000 hectares annually — in Asia alone. And only now have we started realising how stupid we’re being. For wetlands work efficiently, quietly and very unglamorously to keep the world a healthy place. They act like gigantic sponges, sopping up rain and floodwaters — and releasing the water back gradually in the dry season. They filter the muck we dump in them, breaking down the sewage into nitrogen, carbon-dioxide and water. They circulate nitrates. A vast assemblage of animal and plant life depends on them. Rice is a wetland crop, as is that hotshot health-food Spirulina. Mangrove forests provide sanctuary to huge numbers of fish, besides gentling the tides that rush in and out twice a day. Even that wetland hooligan, the water hyacinth, is being investigated for its ability to purify sewage and absorb heavy metals like lead. Some say wetlands are far more productive than even tropical rainforests, though, of course, not nearly as popular. They can be bewitching places — especially for birders. Around 300 species of birds in India (out of 1,300) are dependent on wetlands. 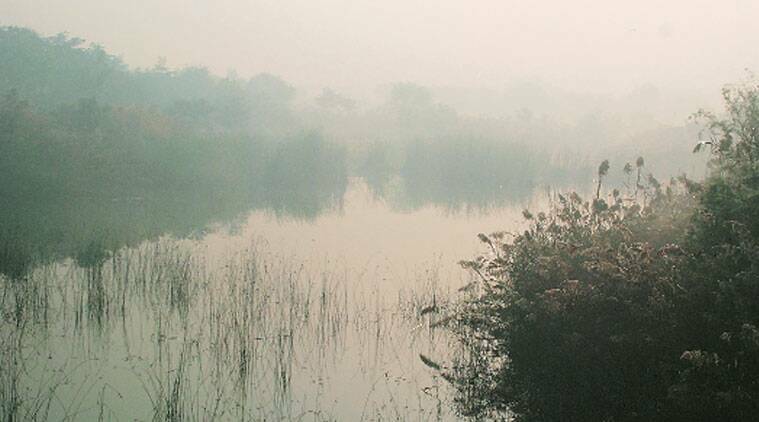 The Keoladeo National Park at Bharatpur, an artificial wetland, is world renowned for the waterfowl it attracts. Other well-known wetlands in India include Pulicat Lake in Andhra Pradesh, Chilika in Odisha, Harike in Punjab and Sambhar in Rajasthan. The Gulf of Kutch attracts some of the largest migratory flocks in the world. They’re busy places, humming and thrumming with drama and action. Sit at the edge of a wetland and watch: right ahead of you dragonflies dart at each other as they sort out territorial airspaces or zither around in honeymooning daisy-chains. A frog with bulgy eyes suddenly plops into the water from the lotus leaf he was sunning himself on. A little way ahead, snow-white egrets stand stock still, bending forwards like badminton players about to serve, before spearing headfirst into the water. Up in the sky, a pied-kingfisher stands on its tail and hovers, taking aim at the silver flash of a fish below. On a washed up dead log, a turtle cranes its neck and reaches blissfully for the sun. A harsh croak startles you, as a purple heron unfurls its resin and slate wings and takes off with slow deliberation – from much closer than you guessed. Then with a sudden thunder of wings, a thousand ducks circle overhead, whiffle and jink and splash down, wagging their tails happily. At least they know a good place when they see one. 1 Stacking the Odds: When was the last time the bookies got the Nobel right?